This Demonstration shows the fluxes and partitioning of energy associated with primary carbon metabolism. The upper-left graph shows the flux of leaf-level net carbon assimilation ( ; ), and the three components that contribute to : the fluxes of photosynthetic carbon uptake ( ; ), photorespiratory carbon loss ( ; ) and mitochondrial carbon loss ( ; ). The three pie charts show the energy partitioned between photosynthesis ( ) and photorespiration ( ) specifically for the partitioning of electrons (top right), of (bottom left) and of (bottom right). This Demonstration uses the leaf model of photosynthesis  coupled with temperature corrections [2–6] to model the net and gross carbon fluxes associated with primary carbon metabolism and the partitioning of energy into photosynthesis and photorespiration. 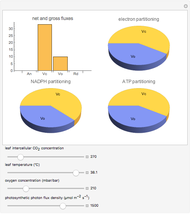 This Demonstration was created as a supplement to a review article on the costs of photorespiration . The leaf model is parameterized with a maximum velocity of the enzyme for carboxylation , a maximum rate of electron transport , a rate of triose-phosphate utilization , and a rate of mitochondrial respiration , as described in [2, 3]. G. D. Farquhar, S. von Caemmerer, and J. A. Berry, "A Biochemical Model of Photosynthetic Assimilation in Leaves of Species," Planta, 149(1), 1980 pp. 78–90. doi:10.1007/BF00386231. C. J. Bernacchi, C. Pimentel, and S. P. Long, "In Vivo Temperature Response Functions of Parameters Required to Model RuBP-Limited Photosynthesis," Plant, Cell & Environment, 26(9), 2003 pp. 1419–1430. doi:10.1046/j.0016-8025.2003.01050.x. C. J. Bernacchi, E. L. Singsaas, C. Pimentel, A. R. Portis Jr, and S. P. Long, "Improved Temperature Response Functions for Models of Rubisco-Limited Photosynthesis," Plant, Cell & Environment, 24(2), 2001 pp. 253–259. doi:10.1111/j.1365-3040.2001.00668.x. C. J. Bernacchi, C. J. Bagley, S. P. Serbin, U. M. Ruiz-Vera, D. M. Rosenthal, and A. VanLoocke, "Modeling Photosynthesis from the Chloroplast to the Ecosystem," Plant, Cell & Environment, 36(9), 2013 pp. 1641–1657. doi:10.1111/pce.12118. P. C. Harley, R. B. Thomas, J. F. Reynolds, and B. R. Strain, "Modelling Photosynthesis of Cotton Grown in Elevated ," Plant, Cell & Environment, 15(3), 1992 pp. 271–282. doi:10.1111/j.1365-3040.1992.tb00974.x. T. June, J. R. Evans, and G. D. Farquhar, "A Simple New Equation for the Reversible Temperature Dependence of Photosynthetic Electron Transport: A Study on Soybean Leaf," Functional Plant Biology 31(3), 2004 pp. 275–283. doi:10.1071/FP03250. B. J. Walker, A. VanLoocke, C. J. Bernacchi, and D. R. Ort, "The Costs of Photorespiration," Annual Review of Plant Biology, forthcoming. Carl J. Bernacchi, Andy VanLoocke, Berkley Walker, Donald Ort "Fluxes and Energetics of Photosynthesis and Photorespiration"